The Leahy Community Health and Family Center (LCHFC), located in McGurrin Hall, was completed in the spring of 2003 and was funded in part by a grant from the U.S. Department of Health and Human Services, Health Resources and Services Administration. The spring 2003 dedication ceremony put forth the promise of innovative opportunities for faculty, students, and community to work together to fill gaps in health, wellness, and educational services to marginalized and underserved populations. Since this time, the LCHFC has actively sought to uncover gaps in services and work with community agencies and individuals to develop meaningful and sustainable responses to these needs. Integral to the Panuska College of Professional Studies' mission is the belief that all disciplines should be taught and understood through a balance of theory and practice in the context of a Jesuit tradition and spirit. The Leahy Community Health and Family Center is designed with this focus in mind. The Center is dedicated to the dual purpose of identifying and meeting the health and wellness needs of underserved individuals in the greater Scranton community while providing a place where faculty guide students in a practical educational experience. 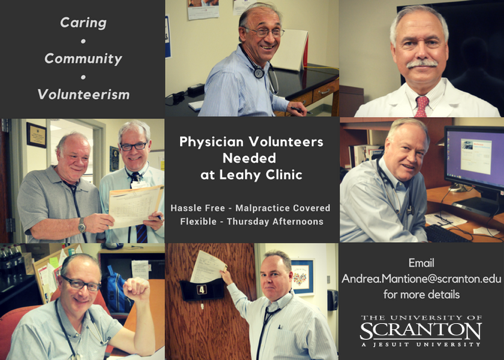 The Leahy Community Health and Family Center envisions a community where all individuals have access to those services that help them achieve, improve, or maintain a quality of life that is consistent with optimal health and wellness. It is intended that the collaborative partnership between the community and the Leahy Community Health and Family Center will provide the resources necessary to support high quality service provision and applied learning. We value the Jesuit philosophy that understanding the importance of educating men and women for others within a context that addresses the whole person (cura personalis). We value the significance of striking a balance between theory and practice, knowledge and application, learning and service. We value the creation of sustainable service and learning experiences that are embedded in the curriculum and that meet the needs of the students and community. We value the cultivation of community partnerships that help identify health and wellness needs, develop bridges for collaboration and access, and provide reciprocal learning experiences. The programs offered by the LCHFC are supported by State Grants, Private Foundations and Corporate Foundations, and individual donors, along with The University of Scranton. For more information on how to be part of The University of Scranton's programs, please visit the Community Relations page.